The Hawaii Association of the Blind held its annual convention at the Pagoda Hotel yesterday. The keynote speaker was Sgt. 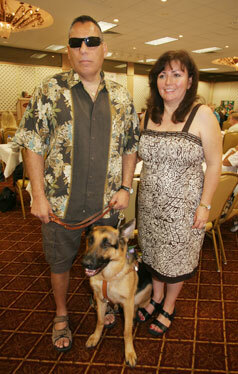 Maj. Jesse Acosta, left, a 50-year-old Army soldier from California, who posed with his wife, Connie, and a service dog. Acosta suffered blindness as well as other injuries after a mortar attack in Iraq on Jan. 16, 2006, and has become a positive force for rehabilitation of disabled soldiers. A 50-year-old California soldier who lost his sight, sense of taste and smell in a mortar attack in Iraq said, "it was a blessing" because now he can help other wounded warriors. "I'm a soldier of the blind," Sgt. Maj. Jesse Acosta said in an inspirational talk at the annual convention of the Hawaii Association of the Blind yesterday at the Pagoda Hotel. In his talk and later in an interview, Acosta described how "a whole new battle ensued" after returning home with injuries from a mortar attack in Iraq on Jan. 16, 2006. He has post-traumatic stress and whistles occasionally when he talks, he said, apologizing. "My palate was blown out and my teeth as well. "Having to defend your country and fight for the liberation of others is one thing," he said. "But having to come home and endure the red tape and bureaucracy we, the warriors, have to go through in order to get the proper treatment ... is another thing. "What they (the military) had to offer us was an absolute insult for us. "For 48 years I was blind; in the last two years, I can see clearly now," Acosta said, drawing applause from his audience. "Well, we know what happened with Walter Reed," he added, referring to the poor treatment and substandard conditions exposed there. He said a dietitian scolded him for not filling out a sheet about his diet that was left on a tray, although he couldn't see either the tray or paper. "That was my introduction to blindness in the United States," he said. "A lot of folks out there don't know how to treat us or how to work with us. They don't know anything about us." He said he refused to sign papers to leave the Army "until they put me back together" and was sent to a military rehabilitation center for the blind in Palo Alto. "What a disaster that turned out to be." He said he got no help there so he went home and "started to pick up the pieces on my own." But after more than 30 years in the Army, lifting weights and running, he said he couldn't do one sit-up. He dropped from 225 pounds to 185 pounds in three weeks. He said he gradually started pulling himself together with assistance from his wife, Connie, three children, three grandchildren and an 80-pound guide dog, a German shepherd named Charlie. He began walking and challenging himself to get in shape, build confidence and self-esteem, he said. Eventually, he was taking the bus on 60-mile round trips to the Junior Blind of America School from his home in Santa Fe Springs, Calif., and he ran the 2007 Los Angeles Marathon. Acosta is studying software to be a data analyst for Southern California Gas Co., where he has worked for 22 years while serving in the reserve as a "citizen soldier." "It's important for me to be free, independent and productive, to get back into the work force," he said. He formed TAV (Thank a Vet), an organization to speak out for better treatment of returning soldiers and help others with blindness -- a campaign that has received national attention. He has broken down a lot of doors that he said "were shut in my way. I go to the top," he said, "because there are nothing but excuses (at the lower echelon). They know me very well in Washington D.C."